In contrast, Carl Schubert's American near-contemporary Benjamin Franklin (1706-1790), the model of Protestant culture held up as an example by Max Weber, believed that 'that the most acceptable Service of God is doing Good to Man'.Franklin would have viewed Carl's spending as ineffectual, being without utility. 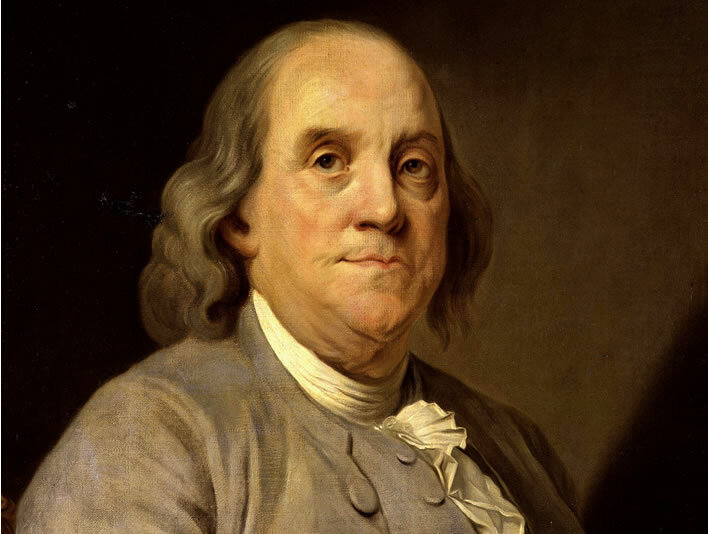 Franklin, a successful publisher and printer – in fact successful at almost everything to which he turned his hand – published a collection of his 'Poor Richard' aphorisms called Franklin's Way to Wealth, full of advice on the benefits of saving and frugality. Weber quotes extensively from Franklin's 'Advice to a young Tradesman' (1748). We have already quoted from some of Franklin's writings. Whilst 'the Cannibals of Europe are going to eating one another again' this time in the 'War of the Austrian Succession', Franklin was writing on wealth and its creation. Austria was maintaining a large standing army, ready for the next cannibalistic feast that would come soon, the 'Seven Years' War'. 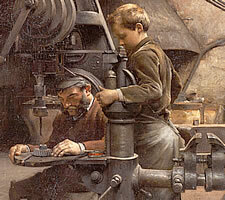 Whilst the feudal serfs who could do so went back to their bits of land for a few years and thought of their harvests and repairing the ravages of war, Franklin and his 'Young Tradesman' were considering how to improve the lot of mankind for the glory of God and make themselves rich while they were about it. In short, the Way to Wealth, if you desire it, is as plain as the Way to Market. It depends chiefly on two Words, Industry and Frugality; i.e. Waste neither Time nor Money, but make the best Use of both. In his moral tracts Franklin is writing in the Biblical tradition of Proverbs, the' Sermon on the Mount' and Paul's Epistle to the Romans, the latter one of the cornerstones of Protestant – especially Dissenting – belief. He was writing for the widest possible audience and expressed himself in plain language and memorable aphorisms, many of which are still current to this day. But [the Presbyterian Minister's] Discourses were chiefly either polemic Arguments, or Explications of the peculiar Doctrines of our Sect, and were all to me very dry, uninteresting and unedifying, since not a single moral Principle was inculcated or enforc’d, their Aim seeming to be rather to make us Presbyterians than good Citizens. At length he took for his Text that Verse of the 4th Chapter of Philippians, 'Finally, Brethren, Whatsoever Things are true, honest, just, pure, lovely, or of good report, if there be any virtue, or any praise, think on these Things'; and I imagin’d in a Sermon on such a Text, we could not miss of having some Morality: But he confin’d himself to five Points only as meant by the Apostle, viz. 1. Keeping holy the Sabbath Day. 2. Being diligent in Reading the Holy Scriptures. 3. Attending duly the Publick Worship. 4. Partaking of the Sacrament. 5. Paying a due Respect to God’s Ministers. These might be all good Things, but as they were not the kind of good Things that I expected from that Text, I despaired of ever meeting with them from any other, was disgusted, and attended his Preaching no more. I had some Years before compos’d a little Liturgy or Form of Prayer for my own private Use, viz, in 1728. entitled, Articles of Belief and Acts of Religion. I return’d to the Use of this, and went no more to the public Assemblies. Seest thou a man diligent in his businesse? hee shall stand before kings, he shall not stand before meane men. Siehst du einen Mann behend [=tüchtig] in seinem Geschäft, der wird vor den Königen stehen und wird nicht stehen vor den Unedlen. Some process in the father or the son's head, much deeper that a simple slip is at work here. The rest of Franklin's quotation is a completely accurate, word for word reproduction of the verse as it stands in the King James translation. The son tells us that his father 'frequently repeated' the verse from Proverbs, so either one or both are using a Bible source I don't know about at the moment – a translation that is exactly the same as the King James Bible except for that one word –	or one or the other of them has substituted the word accidentally or deliberately. If the latter, it would seem to us now to be an interesting and unusual substition to use 'calling' instead of the much easier word 'business'. He that hath a Trade hath an Estate, and He that hath a Calling hath an Office of Profit and Honour; but then the Trade must be worked at, and the Calling well followed, or neither the Estate, nor the Office, will enable us to pay our Taxes. Franklin also presents us with an example of the later Calvinistic (Presbyterianism is a direct descendent of Calvinism) love of systems for moral advancement that Max Weber had discussed. The 20-year-old had already drafted a Plan of Conduct containing four principles for himself. let me, therefore, make some resolutions, and form some scheme of action, that, henceforth, I may live in all respects like a rational creature. Two years later he lays down a much more extensive moral panorama in his Articles of Belief and Acts of Religion. He gives over the whole of Part 9 of his Autobiography to a description of his quite astonishing moral bookkeeping system. He has by now conceived of 13 main precepts and implements them using a little book in which he documents his progress. I determined to give a Week’s strict Attention to each of the Virtues successively. Thus in the first Week my great Guard was to avoid every the least Offence against Temperance, leaving the other Virtues to their ordinary Chance, only marking every Evening the Faults of the Day. Thus if in the first Week I could keep my first Line marked T clear of Spots, I suppos’d the Habit of that Virtue so much strengthen’d and its opposite weaken’d, that I might venture extending my Attention to include the next, and for the following Week keep both Lines clear of Spots. Proceeding thus to the last, I could go thro’ a Course compleat in Thirteen Weeks, and four Courses in a Year. And like him who having a Garden to weed, does not attempt to eradicate all the bad Herbs at once, which would exceed his Reach and his Strength, but works on one of the Beds at a time, and having accomplish’d the first proceeds to a Second; so I should have, (I hoped) the encouraging Pleasure of seeing on my Pages the Progress I made in Virtue, by clearing successively my Lines of their Spots, till in the End by a Number of Courses, I should be happy in viewing a clean Book after a thirteen Weeks daily Examination. ^ Benjamin Franklin, 'Advice to a Young Tradesman', ibid.